Auto Shows give you the opportunity to experience many different cars in a single venue. It also lets you see cars that you wouldn’t be able to see any other place and compare similar models side by side. Chevrolet has you covered in the Camaro department at the 2011 Denver Auto Show. Okay, so the title might be a bit misleading because in my opinion all the Camaros are worth seeing. 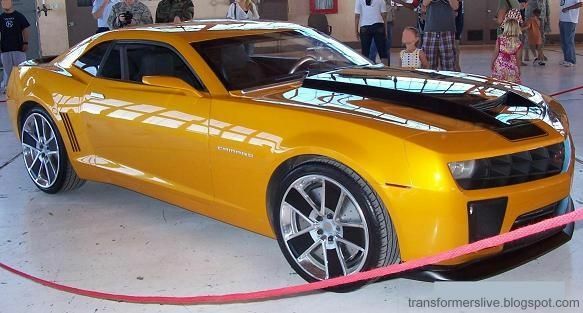 The two Camaros that standout at the Chevrolet booth is the Chevrolet Camaro Convertible and the Bumblebee Camaro from the Transformer franchise of movies. The Camaro Convertible mitigates any sight issues you might have had with the standard Camaro by literally eliminating them with the touch of a button. Also quite remarkable is that the Camaro Convertible looks sharp with the top up or down. Top up sophistication is quite the feat and it even does a nice job of following the roofline design of the standard Camaro coupe. If you had to find a drawback, it would probably be that with the small truck opening and the convertible setup you loose some cargo functionality that you would otherwise retain in the coupe. Then there is Bumblebee. This might not be the first time that you have seen Bumblebee in the flesh, but I for one never get tired of seeing the car at the Auto Show. There is something about a muscle car paired with a classic science fiction story that makes the car just plain cool. The special emblems and wheels don’t hurt either. Now if we could just get it to transform on demand. Besides the two Camaros mentioned above, there are a nice selection of models from Base to SS trim and even the “American Tribute” Camaro (though not in the Chevrolet booth). You can even sign up to drive the 2011 Chevrolet Camaro via the manufacturer ride and drive program available at the 2011 Denver Auto Show. Be sure to check out our entire coverage of the 2011 Denver Auto Show by clicking here.